Some laundry detergents boasting to be 'green' products still contain concentrations of petrochemicals, according to a CBC News investigation. Some laundry detergents boasting to be green products still contain concentrations of petrochemicals, according to a CBC News investigation. 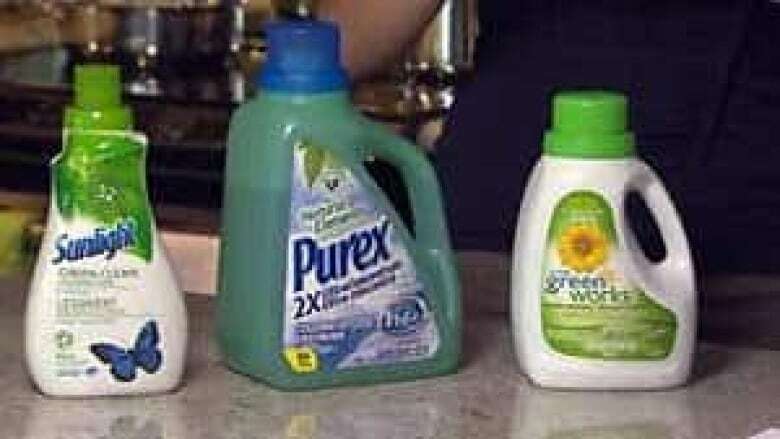 Of the three most popular brands — Clorox GreenWorks, Purex Natural Elements and Sunlight Green Clean — both Purex and Sunlight's products were found to contain petrochemicals, despite their 'green' claims. CBC News commissioned an independent lab to analyze the three detergents. Sunlight Green Clean says it "includes" plant-based ingredients in its detergent and that they have "found a more eco-conscious alternative to just petro-chemical surfactants." But a test on their product found that along with plant-based ingredients, 38 per cent of their detergent content comes from petroleum. "The first fishy thing on this label is the word "includes," said Adria Vasil, author of the book Ecoholic Home. "Basically, that's your tipoff that the whole thing isn't plant based." A test on Purex Natural Elements, which also claims to be "naturally sourced" and "95 per cent natural", revealed that 30 per cent of its ingredients come from petroleum. P.O.V. :Do you buy products for their 'green' or 'natural' claims? However a test on Clorox revealed that 98 per cent of its ingredients are plant-based. "This tells me that they've actually done the testing and they're willing to be transparent with their consumers," Vasil said. Both Purex and Sunlight defended their products. Henkel, the makers of Purex, said in a statement that: "the 95 per cent natural claim is calculated based on all of the ingredients in the detergent including cleaning agents, water, and fragrance ingredients." Henkel added that "Purex Natural Elements has been recognized by the U.S. EPA Design for the Environment" and that it discloses the list of ingredients on its website and on every bottle of its detergent. Sunlight said that it has made "significant positive strides to reduce the environmental impact of our product." It said that the U.S. Department of Agriculture allows any laundry detergent with 34 per cent or more of bio-based carbon content to be categorized as a bio-preferred product and that the 62 per cent in Sunlight Green Clean significantly exceeds that. "We made a positive decision in the development of Sunlight Green Clean to produce a laundry detergent that contained significantly more plant based than petroleum based surfactant, but not to sacrifice cleaning performance." But Vasil said companies are simply taking advantage of a lack of regulation. "It's basically an indication that the government needs to step in and say we cannot allow misleading labeling to continue because it's basically duping the consumer." P.O.V. : Do you buy products for their 'green' or 'natural' claims?